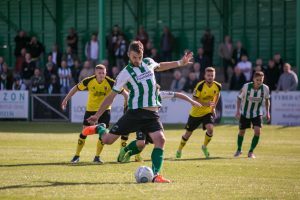 A tireless performance by an injury-hit Blyth Spartans was undone after Jon Parkin dispatched a highly contentious penalty, 11 minutes from time to break the deadlock at Bootham Crescent. Referee Ben Speedie adjudged Connor Oliver handled the ball from David Ferguson’s cross, much to the disbelief of large sections of the ground, allowing Parkin to fire York into the initiative. Frustration further flowed for Alun Armstrong and his backroom staff after Robbie Dale saw a penalty appeal turned down, despite it seeming more of a spot-kick to the one that was awarded to Minstermen. Substitute Adriano Moke then secured the three points in the final minute. This followed from what was already a drama-filled first-half after Kieran Green was shown a straight red for a poor challenge on Ferguson before Russ Penn’s second yellow made it 10v10 on 37 minutes. Armstrong was forced into one change from the side that suffered a narrow lost to Chorley, Lewis Horner starting his first game of the campaign in place of the injured Jamie Holmes. Holmes joined Bradley Fewster, Aaron Cunningham, Sam Brotherton, Ryan Hutchinson on the injury list plus a few of the squad carrying slight knocks from Saturday. Peter Jameson was in fine form on his 50th club appearance, with the first of three outstanding saves, following on 13 minutes. Former Spartans loanee Macaulay Langstaff thought he had arrowed his shot into the right corner, only for Jameson to stick out a left hand and divert the shot away from danger. Langstaff continued to get on the end of the York openings, most noticeably when he picked up a long ball from Simon Heslop, however, laced his shot off target. Jameson then cancelled his sweeping keeping skills to stick out a leg and prevent the striker from having a shot at an empty net. But for all of York’s positive beginning, Sean Reid should have put the visitors ahead when Oliver’s free-kick was met by Nathan Buddle before Reid swiped his shot over from close-range. Spartans were starting to settle, but momentum hit a standstill when Green received his deserved red card just after the half-hour mark. Wes York tried to make his side’s one-man advantage instantly count when he powered an effort past the post. Then, Langstaff was thwarted by Jameson for a second time, producing a similar save to the first. But just as York got into gear, Penn was shown his second yellow – following an early challenge of Green – preventing Lewis Horner from breaking away. Crosses into the box almost breached Spartans with York inches away from sliding home Langstaff’s cross. Joe Tait also headed over at the back post from Laws’ inswinging set piece. The second half didn’t take long to get going – Jameson, for a third time, plucking the ball out the bottom corner with York ready to celebrate a 52nd-minute opener. Adam Barlett then replicated Jameson’s heroics. In a goalmouth scramble, Reid flashed a header across goal before the ball was fired back into the area – Dale witnessed his header tipped onto the crossbar by the former Spartans favourite. Langstaff, capping off a hatful of opportunities, volleyed over the crossbar before his precise touch created the space to shoot viciously past the post. Blyth for all their hard work and determination give it their all to push forward and enjoyed a nice little spell in possession with Horner and Dale trying their luck from distance. At one point, Maguire was almost in on goal only for Kallum Griffiths to produce a potential game-saving interception. Armstrong’s men worked tirelessly throughout but unfortunately, their efforts were to be undone by another dubious penalty decision at Bootham Crescent. It appeared Oliver had his hands down by his side but a few shouts from the home supporters behind the goal saw referee Speedie point to the spot, several seconds after the incident had happened. Parkin, on as a second-half substitute, sent Jameson the wrong way – dealing a cruel blow on the visitors, but that wasn’t to deter them. Adam Wrightson almost made an instant impact after replacing Jarrett Rivers as Bartlett awkwardly parried the winger’s shot away from danger. The penalty shout on Dale then occurred when he was felled at the byline, though sportingly regained his balance – teeing up a golden chance for the returning Damen Mullen, however the substitute agonisingly cut his shot wide. With Spartans giving every last breath in order to force a leveller, that left them vulnerable at the back, and the fresh legs of Moke secured three points for the hosts when latched onto a long ball – chipping the ball over Jameson before scoring into an empty net. York: Bartlett, Griffiths, Bencherif, Tait ©, Ferguson, Law, Penn, Heslop, York (Parkin, 69), Wrightson, Langstaff (Burrow, 85). Subs not used: Allan, Whitley. Blyth: Jameson, Nicholson (Butler, 86), I. Watson, Green, Buddle, Reid, Rivers (Wrightson, 81), Oliver, Maguire, Horner (Mullen, 77), Dale ©. Subs not used: Ardelean, Skirpan.